Breaking Bands Festival has become one of the most widely known independent festivals these past 5 years and firmly cemented into the event calendar for rockers and metalheads across the country. Stage 2 will be outside (under cover) and will be known as the Rock n Growl stage. This will feature bands carefully selected from headline sponsor WaterBear in association with Breaking Bands Festival. 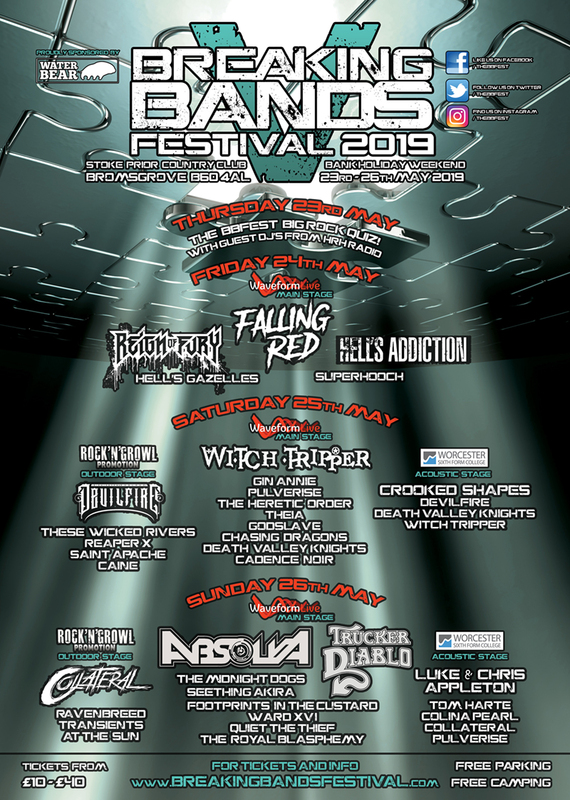 All bands that are new to the event but some that are well known starting with 2 very popular Midlands based bands, These Wicked Rivers & Devilfire both ready and waiting to blow your socks off! Alongside these 2 rock bands are Collateral who performed at the HRH Awards at the end of 2018 as well as Ravenbreed & At The Sun who both reached the finals of the HRH Highway to Hell 2018 competition in Sheffield. With London based rock band Caine, metalcore from Reading in the shape of Transients, thrash metallers Reaper X from Corby and Saint Apache from East Sussex there is a bit of something for everyone! Firstly introducing Colina Pearl, a London rock band with highlights of metal and undertones of grunge. Next up is Crooked Shapes, a groovy blues band with a rock attitude. Alongside these new faces will be Pulverise who will open the day with a pyjama party acoustic set to get everyone in the mood! Devilfire and Collateral go unplugged too and expect something special acoustically from London rockers Death Valley Knights. By popular demand the organisers daren’t not invite Witch Tripper back after last years performance on the acoustic stage which this year means they will open and close the days events. Special guests Absolva lend 2 members of the band for a walk down memory lane as Chris & Luke Appleton will perform again as they did in 2016 and to cap off this amazing line-up is one of Northern Irelands best exports as front man of Trucker Diablo, Tom Harte makes his English and festival debut as a solo act performing his magnificent EP Life, Love and Everything Inbetween.